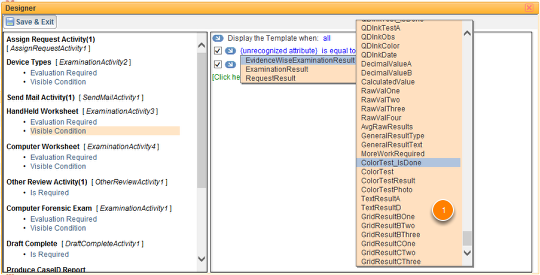 I have fields missing from my analytical module visibility rules condition builder. – Welcome to JusticeTrax Customer Care! In LIMS-plus v5, you have the ability to set rules for when each examination work flow block in your analytical module appears. For example, you might have a tab for a parallel examination activate only if a check box on another tab is checked. To do this, you set conditions for visibility. There are times when the fields you need to use to build these rules do not appear in the drop list, such as when a field property is changed. To correct the issue, you need to regenerate the XML related to the DUI (dynamic user interface) being used by that block. To build or modify visibility rules for an analytical module, find the module you want to edit using Admin> Analytical Module. Click the rules icon (cabinet) or you can click the Define Rules button from within the analytical module visual designer. When defining a visibility rule, you set the conditions for when that block is visible. This may require selecting a field you created for use on a DUI. If the field you need is not on the list (1), you need to regenerate the DUI XML. 1. Click the Generate XML button. 2. Save the DUI form. Go back to the analytical module rules builder and the missing field should now be available.